Michael Jackson, the “King of Pop” who once moon walked above the music world, died by cardiac attack at age 50, on Thursday . The World is shocked and stunned by the sad demise of pop star. A lots of fan worldwide mourn into his death by remembering a “tortured genius” whose squeals and moonwalks captivated a generation and sparked global trends in music, dance and fashion. 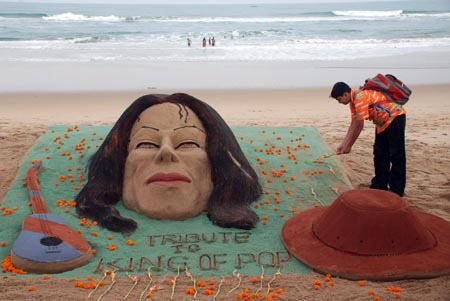 Internationally renowned sand artist Sudarsan Pattnaik from Orissa giving tribute to him in a unique way through his art by creating a sand image of Pop star Michael Jackson on Puri beach, Orissa. He took 4 hours and 2 tones of sand to create the 4 ft height image. Also his students of Golden sand art institute joined him in accomplishing this sculpture. Lots of people and tourist gathered to tribute the pop star Michael Jackson.